Title: 25th Anniversary Symposium for the Center for the History of Print and Digital Culture. 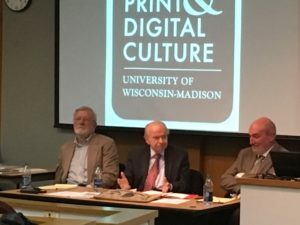 On Thursday, November 10th, we kicked off what will be a year-long celebration of the 25th anniversary of the Center for the History of Print and Digital Culture at the University of Wisconsin. Current director Jonathan Senchyne invited a panel of guests – all influential founders of the Center for the History of Print Culture in Modern America (our original name) in 1992 – to honor the critical work accomplished during the Center’s early years and to ponder new directions for the next twenty-five years. As for future directions, consensus rested upon the need for stronger outreach efforts. 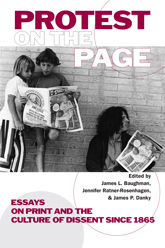 The recent name change from the Center of the History of Print Culture in Modern America to the Center of the History of Print and Digital Culture hopes to do just that by promoting the need for and access to research and scholarship within the purview of textual studies writ large.